The Howe and Smallwood warehouse sits at the south end of the town. Adjustments to the ground level will have to be made before the building can be permanently installed. Oakdale was a town with several warehouses for grain. After all, that was the major commodity carried by the S&C in the '90s. 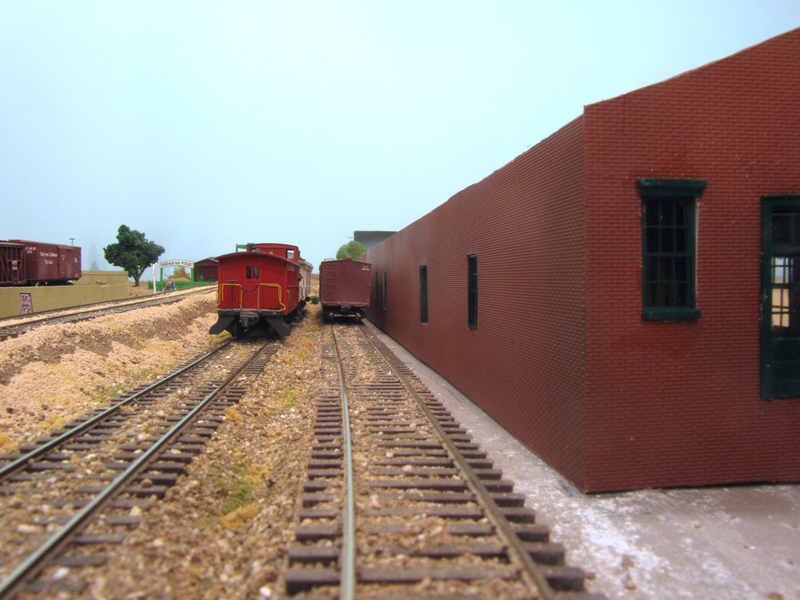 The Howe and Smallwood warehouse sat on the west side of the main line at the south end of town. 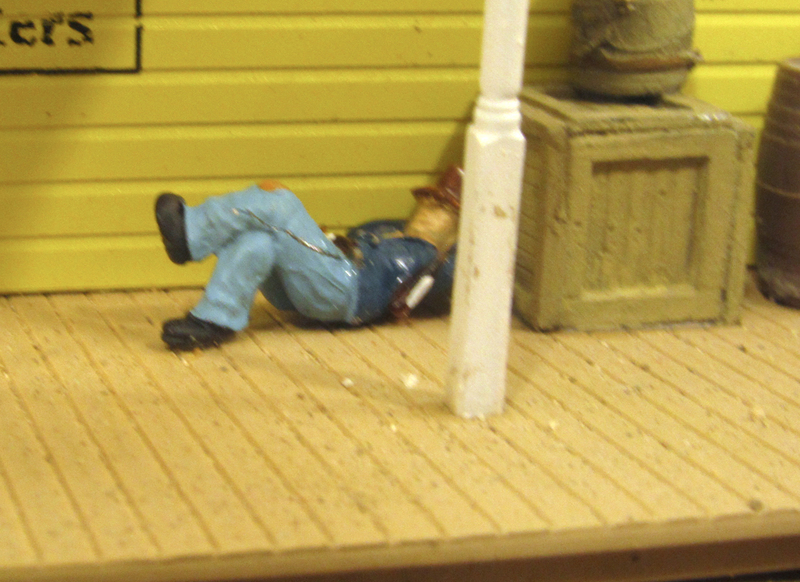 On my model, that puts it across the tracks from the Oakdale Lumber Company. The prototype structure measured 50 x 400 feet which is way too big for the space I have. I cut the length down to 200 feet but left the width the same. This posed a dilemma since the benchwork was not wide enough to accommodate this width. I decided to slice off part of one side which would result in a model with one wall open. Of course, this meant that I had to provide an interior for the building which was pretty simple since it would be more stacks of grain sacks. 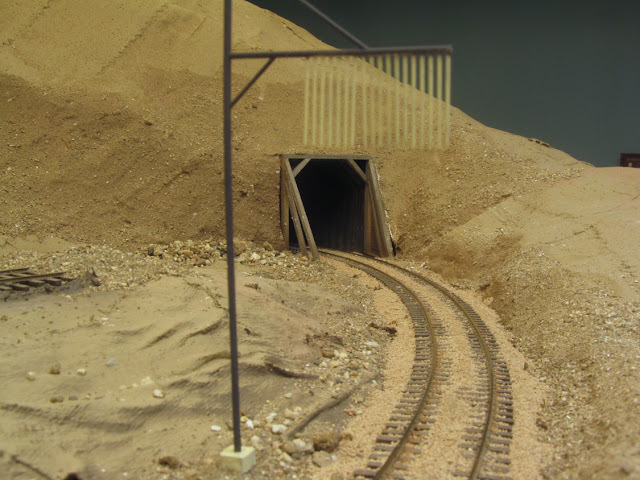 A trackside view shows the loading door and a window. The office door and window are on the building's end at the right of the photo. 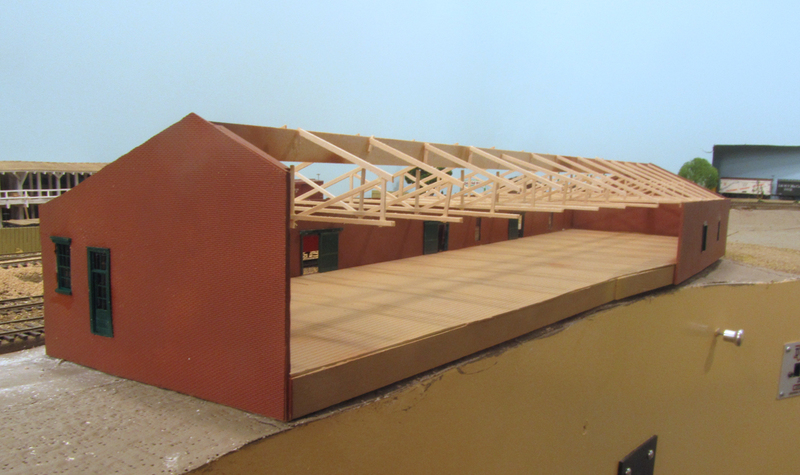 The open side also meant that I would have to construct roof trusses. Yesterday, I spent the afternoon building these trusses using a jig I built. It was not difficult except for the time spent waiting for the glue to dry so I could take it out of the jig. Thirteen trusses later, I was done and assembled them to the building and the way oversized ridge. On half the trusses, part of them would be cut off where the wall didn't exist and they would be supported by this ridge which wouldn't be visible once the roof was on anyway. The partial roof trusses can be seen in this view. Now I need to fill up the place with grain. Today, I'm spending a lot of time casting up more grain sacks to fill up the warehouse. 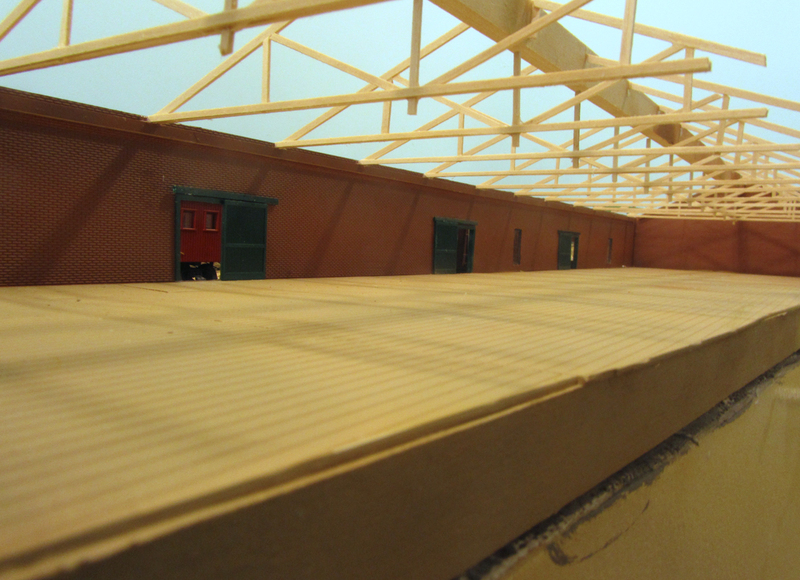 Some workers and hand trucks will be added to complete the scene and then I will attach the roof, shingle it and add exterior details. Dr. Borkon extolls the wonders of Pocahontas to the snappy tune of the hurdy-gurdy while one of Oakdale's finest looks on the background to ensure there will be no flim-flam. Folks of the nineteenth century wanted entertainment as much as any of us in the twenty-first century. 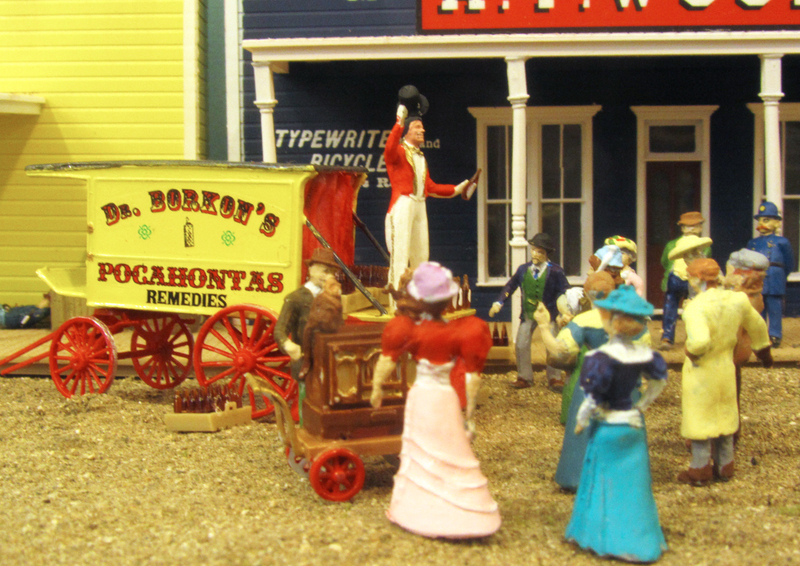 Concerts in the park, theater shows and the traveling medicine show provided much gaiety. Oakdale now plays host to Dr. Borkon's show, complete with jokes, stories, trained monkeys and songs accompanied by concert quality music played on a genuine hurdy-gurdy. Of course, if you are feeble, lethargic, asthmatic, bothered by heart palpitations or have aches and pains, you can buy a bottle of Pocahontas Remedies guaranteed to cure or, at least, make you forget your ailments. photographist than sampling the Remedy. Pocahontas seems to be very popular with the male population of Oakdale. Dr. Borkon's wagon was built from a Jordan kit with custom decals and added curtains and stage drapes made from a single ply of facial tissue. The audience is composed of several cast metal figures while the hurdy-gurdy and Dr. Borkon are by Presier. The photographer is from Lindsey, a British company. The bottles and cases are from Presiser. Incidentally, the name Pocahontas Remedies is from a brew that Will Rogers sold in his film Steamboat 'Round the Bend made in 1935. 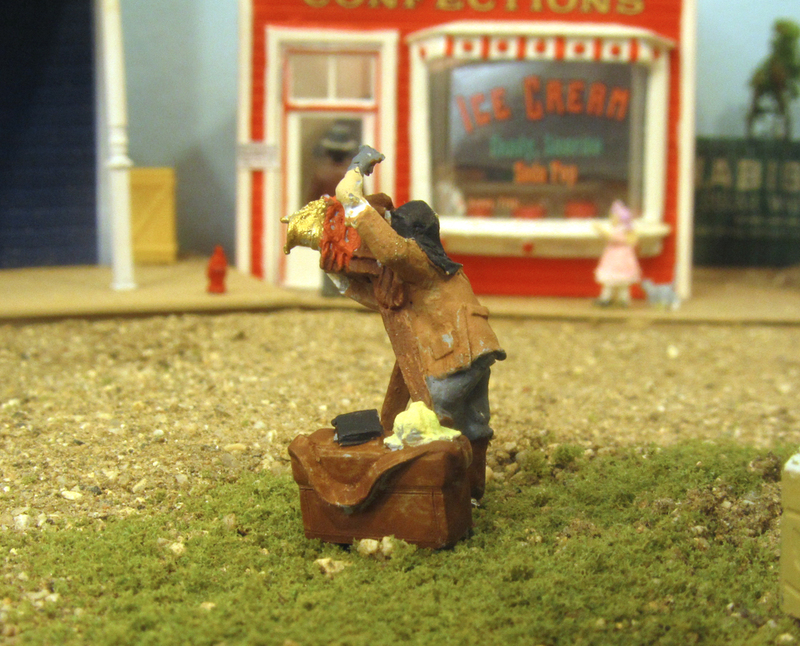 The name Dr. Borkon, however, is completely made up and any resemblance to any Kansas City model railroaders, living or dead, is purely coincidental. Telltales now protect train crews of the Copperopolis Road. The Stockton & Copperopolis management finally grew tired of replacing brakemen who had been knocked off car tops when passing through Gopher Hill Tunnel. To help end this problem, telltales were installed at each end of the tunnel. At least the brakemen would get a warning when the train passed beneath the hanging ropes and would, hopefully, have enough sense to lie down on the car until they were out of the tunnel. It seems to have worked since there have been no complaints from the train crews and no reduction in the work force. It looks like it will be a stormy day over Gopher Ridge. The east end of the tunnel is also protected by a telltale. 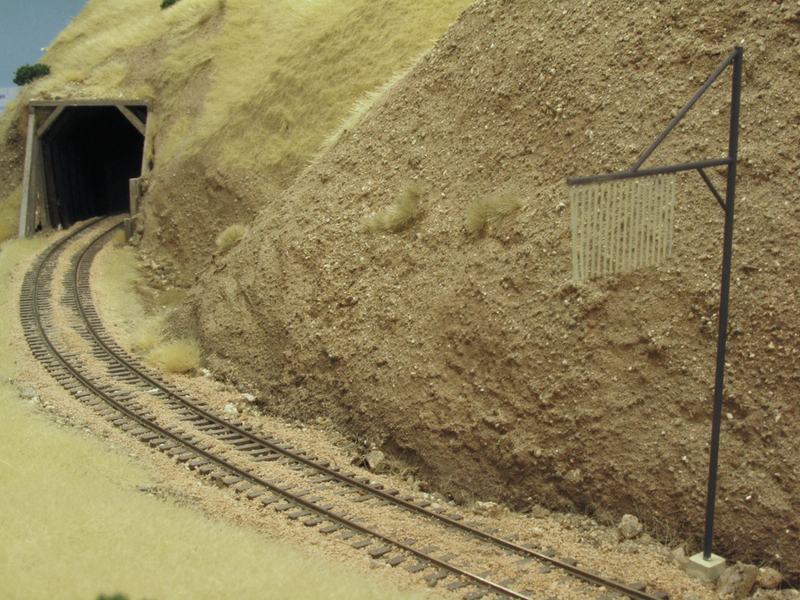 Scenery is yet to be added on this portion of the railroad. The telltales I installed were made by Tichy and they come two to a package. Mine were simply painted Grimy Black while the hanging "ropes" were painted Antique White to make them look like they've been out in the weather for a while. The bases were painted a concrete color. This was a quick project to fill the time while I was waiting for paint to dry.